Life of Pi opens with scenes of the contained wildness of a zoo in Pondicherry, south-east India. The narrator, Pi Patel, whose family owns the zoo, describes his childhood as a paradise in which his ‘alarm clock’ was a pride of lions; on his way to school he would make his way past a pyramid of turtles and the yellow open mouth of a hippo, a camel with a senile, lecherous expression. In 1977, when he is sixteen, the family decides to emigrate to Canada. They take the animals with them, travelling by cargo ship across the Pacific. But the ship sinks, leaving only five survivors: Pi, a zebra with a broken leg, an orang-utan, a hyena and a Bengal tiger. Soon the only two left on the twenty-six-foot lifeboat are Pi and the tiger. Pi finds a survival manual on navigation among the lifeboat stores, but after some months it completely disintegrates. He has no idea how to navigate by the stars and the boat has no rudder, sails or power. Life of Pi - the first novel from a Scottish publisher to have been shortlisted for the Man Booker Prize – is an extravagant flight of the imagination, an implausibly plausible narrative told with panache and conviction. 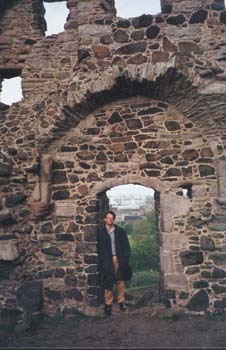 Yann Martel was born in Spain and now lives in Montreal. He is the author of Self, a novel, and a collection of short stories, The Facts Behind the Helsinki Roccamatios. In describing the deaths of the zebra, the hyena and the orang-utan you don’t spare any gory details. Why is that quite so strong? I live in a society that is in terrified denial of ‘unpalatable’ realities, realities I prefer to face. Given that his travelling companion was a Bengal tiger, it seems predictable that Pi’s story will be dismissed as fantasy. Why do you make it so far-fetched? In order to raise certain important questions. When he arrives at the coast of Mexico after drifting across the ocean for 227 days, Pi gives accident investigators the whole story of his ordeal. However much he insists that it all happened, they tell him it is too fantastic to believe. Pi then gives a more plausible version of events, which satisfies them. He had told them two stories. Both had the same beginning: a ship leaves India. Both had the same ending: there is only one human survivor – in either case, the investigators only have his word for what happened. Pi asks the investigators, ‘If you stumble about believability, what are you living for?’ He says, ‘Love is hard to believe, ask any lover. Life is hard to believe, ask any scientist. God is hard to believe, ask any believer.’ He wants to know why they have a problem with ‘hard to believe’. Does Life of Pi reflect your own spiritual quest? Like most people, I am trying to make sense of life. What’s it all about? Why are things the way they are? What’s my role here? Do I have a role? Every writer comes from a certain context. I had an agnostic upbringing in Quebec, in a strongly anti-clerical, anti-religious culture. At university, where I studied philosophy, part of my training was to cut to shreds all the proofs of God. A spiritual perspective was missing in my life, and so I started attending mass at a Catholic church. Later, visits to holy places on my travels to South America, India and the Middle East drew me into reading religious texts and I discovered that while there are common themes in the teachings of the mystics of every tradition, this doesn’t mean they are the same. The great world religions are fundamentally distinct. Christianity and Islam are centred on ‘I’, which doesn’t imply egocentricism, rather, that individual assent is crucial, it makes redemption possible. Whereas in Hinduism and Buddhism the self is an illusion. Mystical writings in all traditions acknowledge the mystery of life and suggest ways of engaging with that mystery, even though it remains impossible to comprehend intellectually. You can view the world in different ways – historical, scientific, social, political – but there are limits to what you can do with a calculator or a hammer. You must make a leap of faith to get the full flavour of life. ‘Pi’ is something of a mystery in itself in that it represents the ratio of a circle’s circumference to its diameter – 3.1415926… etc – but it seems impossible to take it through to the last number after the point. Like ‘pi’, life is not finite. 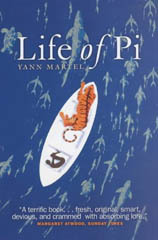 And so I didn’t make the title The Life of Pi: I deliberately left out the definite article. That would have denoted a single life. This book is not escapist fiction. It’s to do with discovering life through a religious perspective. Religion doesn’t deny reality, it explains it. Secular critics ask, ‘How can you believe?’ This question doesn’t faze people with faith. Rationality is only part of the picture. Science and religion don’t have to collide – I see them as complementary, rather than contradictory. Science can be a gateway to the greater mystery. Kafka, Faulkner, Dos Passos, Hemingway, Hardy, Dickens, Eliot, Woolf, Conrad, Ford Maddox Ford – great writers, who opened me up to the possibilities of the novel and drew me into exploring the play of language and imagination. For example, Kafka’s Metamorphosis. The weirdness of the idea of living as a beetle. There is a scene where he edges into the room to listen to his sister play the violin and the boarders staying with his family are shocked and repelled by his appearance. His father throws an apple at him. It gets stuck in his shell and starts to rot. That image held so much horror for me. The whole concept is so startling it disturbs your assumptions. Would you say that religion and fiction work in the same way? 1) Life is a story. 2) You can choose your story. 3) A story with God is the better story.